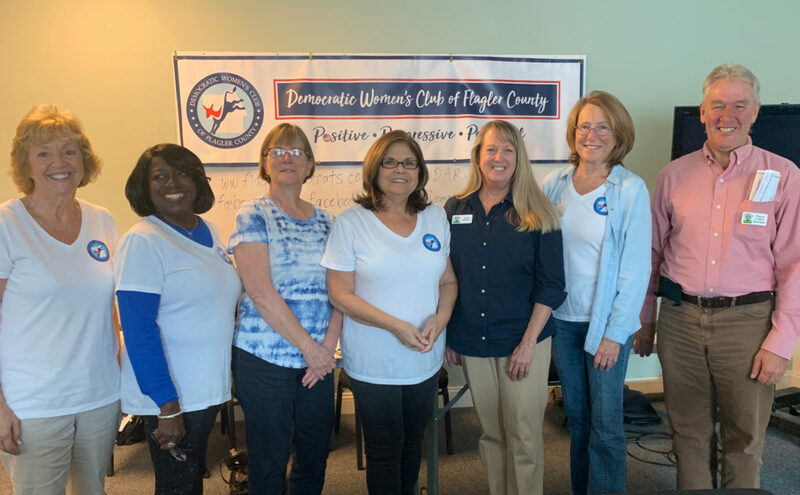 The Democratic Women’s Club of Flagler held its monthly general meeting on February 9, 2019, at the Fair Trade Café in Palm Coast. After a lively business meeting, featuring the upcoming Tally Days, we heard from our guest speakers. Ellen Kincaid and Martin Collins told us about the Sheltering Tree, the completely volunteer cold-weather shelter for the homeless in Flagler County. They spoke of the practical needs as well as the compelling personal stories of the people they serve – the homeless, and the nearly homeless. The message came through loud and clear that homelessness is a real issue in Flagler County, it is growing, and it could happen to any of us. No one in the room remained unmoved by the humanity, compassion, and commitment to basic human dignity for our fellow human beings that Martin and Nancy displayed. Aside from the enormous task of providing temporary shelter on nights when the temperature dips below 40 degrees, the Sheltering Tree helps the homeless and nearly homeless on a weekly basis. Each Wednesday, the group interviews people who come for help to assess their individual needs, and then refers them to available services, when possible and appropriate. One service that they would like to restore is a shower and laundry facility. Being able to bathe and wear clean clothes is something that goes to the core of human dignity – yet it is something we all take for granted. Unfortunately, a donated trailer that was used for this purpose was shut down due to a local ordinance. If you want to help, the Sheltering Tree’s number one need is money. They are completely volunteer, non-sectarian, though physically based in a church building. Any money you donate goes directly to support their services. Our next meeting will be March 9, 9:30 a.m., Fair Trade Café, Palm Coast, where we will learn about the Florida Legislature.